Keelung is a second largest seaport city of Taiwan situated in the northeastern part of Taiwan. 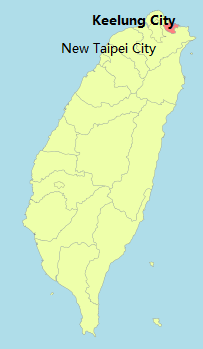 It borders New Taipei City and Northeast coast facing Pacific Ocean. Has a population of 372,226 people in Dec 2014, ranked 16th of 22 counties and have a density of 2,804 people per sq.km. Most people talk about Keelung, they talk about Miaokou Night Market, that's why I started introducing this as the first sight that you may want to visit. Keelung Miaokou Night Market is a special and well known, special is because although it named as "Night Market" but most of the stalls open as early as 1030hrs to 0200hrs in the morning, is well known because right in the centre of the food street there is a well-known temple DianJi Temple which was built during the Qing Dynasty in 1873, and the food stalls stated as early as in the Japanese occupation period, many hawkers start selling food here to people who visit the temple during folk festival to express their gratitude to the gods and goddesses worshipped in this temple. The unique historical background of Taiwan enriches its food culture. Beside the Fujian and Canton food, there is Aboriginal, Dutch, Spanish, Japanese and the arrival of the national government, the local people developed new food styles from all these difference cuisines. Seafood is what you should not missed in the night market, because Miaokou is situated near the harbour and seafood are fresh from the port. This was probably built more than 300 years ago during the Spanish and Dutch colonial periods to safeguard the harbour with the gun emplacement on the east shore. Was also an important military base since Qing Dynasty and occupied by French troops during the Sino-French war. The Japanese colonial government rebuild the place to become the way it looks like today during the Russo-Japanese war. Anyway, is a great place for visitors to overlook Keelung Harbor, the scenery is beautiful too. 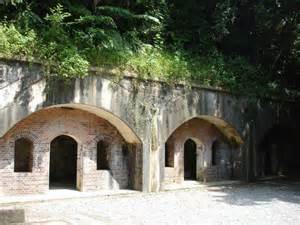 Ershawan Fort is also name "Haimen Tiansian", which means very dangerous gate to the ocean in Chinese, was built by Qing government in 1840 used to defend Taiwan during the Opium War against the British. The walls of the main entrance to the fort are stones laid using the traditional way to build city gates, this fortress gate is still well preserved. 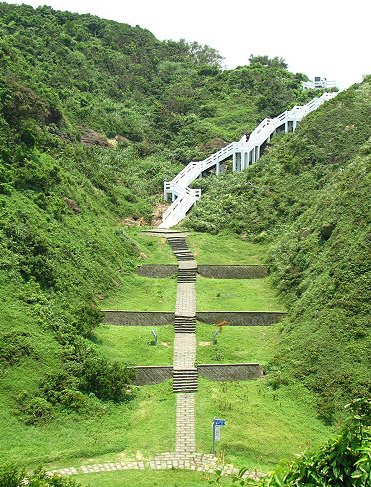 The Badouzi Park is at Badouzi seacoast, it has trail, pavilion and sea-viewing platform for visitor to view the landscape of Keelung Islet. There are three high points area (Point 65, Point 80 and Point 110) for you to explore and view the bay at difference height of Badouzi fishing port, the biggest fishing horbour of north Taiwan. The Keelung's only mountain lake on Dawulun Mountain, beautiful lake and refreshing scenery. The park has round-mountain trails, a lover's bridge, a windmill and scenery viewing platforms too.